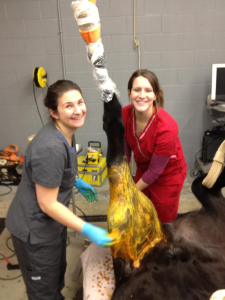 Vermont Large Animal Clinic Equine Hospital is a referral and ambulatory practice service Vermont and upstate New York. VLACEH offers an externship program for students seeking a shared experience in both equine ambulatory and hospital practice. Our practice includes five veterinarians, five ambulatory vehicles equipped with digital ultrasound, digital radiography, endoscopy, and shockwave therapy, and a fully equipped surgical facility. We service horses of all ages, breeds, and disciplines. Our services include lameness, internal medicine, reproduction and neonatal care, pre-purchase exams, and preventative care. Extern candidates should have an interest in pursuing a career in equine medicine and have prior experience in handling and treating horses. Externs are expected to assist veterinarians and technicians in daily work, and to be available for emergency calls at night and on the weekend. Externs should have a strong work ethic and have a positive attitude. Successful completion of an externship with VLACEH is a pre-requisite for those individuals in applying for our internship program. Prospective externs should submit a cover letter, resume, and photo in addition to a completed copy of our externship application. Externship applications are taken on a rolling basis. Externships are scheduled on a first-come, first-serve basis; however, priority is given to 4th year veterinary students. Please include in your application the dates you would like to spend with us. 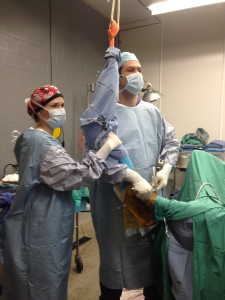 The practice is open to externs year round. However, we strongly encourage externships to be scheduled between March and September to facilitate a broader learning experience. Externships typically last 2-3 weeks. On-site housing is provided for externs and is limited to two externs at a time. Students are free to arrange their own accommodations if desired. Please forward externship inquiries and applications to Heather Aliquo. Vermont Large Animal Clinic Equine Hospital offers extensive equine veterinary services in Vermont and upstate New York, for all ages, breeds, and disciplines. VLAC Equine Hospital serves as a referral equine medical and surgical hospital for Vermont, New Hampshire, and upstate New York. Our Ambulatory service provides primary care, preventative medicine and vaccinations, new foal and wellness exams, lameness and pre-purchase exams, reproductive services, and dental procedures. Diagnostically we have the ability to perform radiographs, endoscopic, and ultrasonography examinations in the field when necessary. The facility at Vermont Large Animal Clinic is equipped to stabilize and care for critical equine patients, as well as work-up and diagnose the cause of chronic disease processes. The hospital has a surgery room, one induction stall, one recovery stall, a special procedures suite, treatment area, pharmacy, laboratory, 8 stalls, a round pen, and an isolation barn dedicated for the treatment of horses with infectious diseases. Our clinic has computed digital radiography, digital ultrasound, 2-meter and 3-meter endoscopes, IRAP, PRP, Shockwave Therapy, and pneumatic and electrical dental equipment. In-house bloodwork can be completed within minutes, including complete blood count (CBC), serum chemistry analysis, and in-house lactate levels. VLACEH offers close patient monitoring, and overnight staff are always available when 24-hour monitoring is necessary. Vermont Large Animal Clinic Equine Hospital is also available for emergency services 24 hours a day, 7 days a week. Vermont Large Animal Clinic Equine Hospital offers a complete internship experience with a wide range of in-house clinical and ambulatory practice in addition to a referral case load. Interns work in a learning environment where they get exposed to all facets of equine practice. 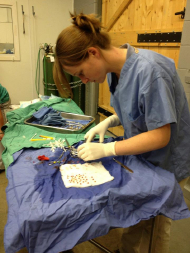 Interns learn daily from five veterinarians, including one Board Certified Surgeon. Interns cycle between in-house and field service rotations every 2 weeks. Ambulatory responsibilities include riding with associate veterinarians, seeing cases alone, and emergency calls. In-house care involves outpatient appointments, in-house patient care, anesthesia, medicine, and surgery cases. The caseload variety presents a good learning experience that will prepare the intern for a quality private practice job or further training in a residency program. More information about the internship is available on our AAEP Avenues - Internship page. All inquiries and applications for internships should be forwarded to Heather Aliquo.